Headlines, hot news, and conversation starters on September 11, 2017! 1 As we all know by now, Rachelle Ann Go got engaged in Boracay last week to her American boyfriend Martin Spies. 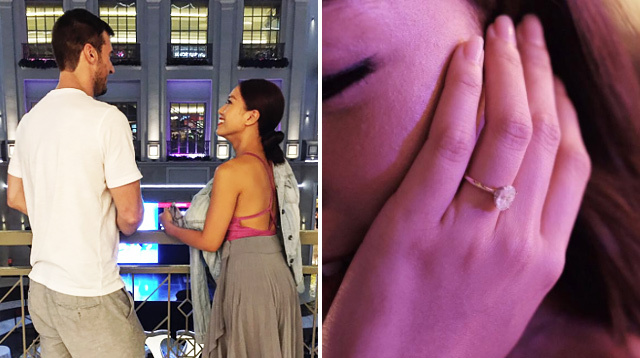 While the Broadway star has been quiet on social media since she announced her engagement, Rachelle's good friend, Erik Santos, just gave us our first look at her engagement ring! Here's Erik's IG picture of Rachelle sporting a round-cut diamond with a delicate gold band. LOVE. IT. Doreen: "Ellen's specialty, paksiw [na lechon]." Ellen: "That's what he likes..."
Doreen: "Uy, stop arguing uy, samok [kulit]." Doreen to JLC: "Sige ha, masamad [masugatan] ka na naman ulit." Ellen: "That's what he likes." JLC: "I'm just saying, baby, I'm just saying, okay?" 3 The National University Pep Squad totally owned the Mall of Asia Arena during their first half-time performance of the UAAP Season 80 opening. A-MA-ZING! 4 Piolo Pascual and Toni Gonzaga are starring in a new dark rom-com, Last Night. Here's your first look at the Star Cinema movie, directed by Joyce Bernal and written by Bela Padilla.